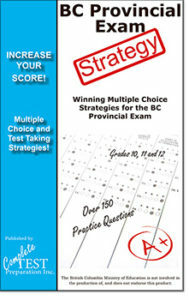 Taking the British Columbia Provincial Test? We can help! Free practice test questions, test strategy, in PDF download, and printed book! All students in grades 10, 11, and 12 must write the provincial exams. Exams are held in November, April, May and August. All exams are electronic (computer based) only. Tips for increasing your score on electronic exams. Order PDF Download Version - $9.99 PDF Version of Printed Version. Download after purchase. No Shipping! No Waiting! Printable PDF version of Paperback - Optimized for any platform - PC, MAC, Smart Phone or Tablet! The BC Provincial Exam is administered by the Province of British Columbia, Ministry of Education, who are not involved in the production of, and do not endorse this publication.